Inscribed in ink on the old mount: Ly Holland Ld Holland - Mrs Brown. Landseer first visited Holland House in August 1833 and stayed there again for a fortnight in 1836 in order to paint the portrait of Dr Allen. Mrs Brown, Lady Holland's lady's maid and later her formidable housekeeper, died leaving all her savings to her mistress. Her sitting room in the east wing of Holland House was known for many years as Mrs Brown's Room (Ilchester, Chronicles of Holland House, 1837, p 477). In spite of Landseer's uncompromising treatment of Lady Holland in this drawing their relations were excellent and he could often be seen pushing her wheelchair across the gardens of Holland House (Fanny Kemble, Records of Later Life, 1882, I, p 103). The enormous hat with ostrich feathers was fashionable from 1829 to 1833 when it was replaced with a high crown hat. The occasion of Landseer's first visit to Holland House in 1833 was therefore the probable date of this drawing. 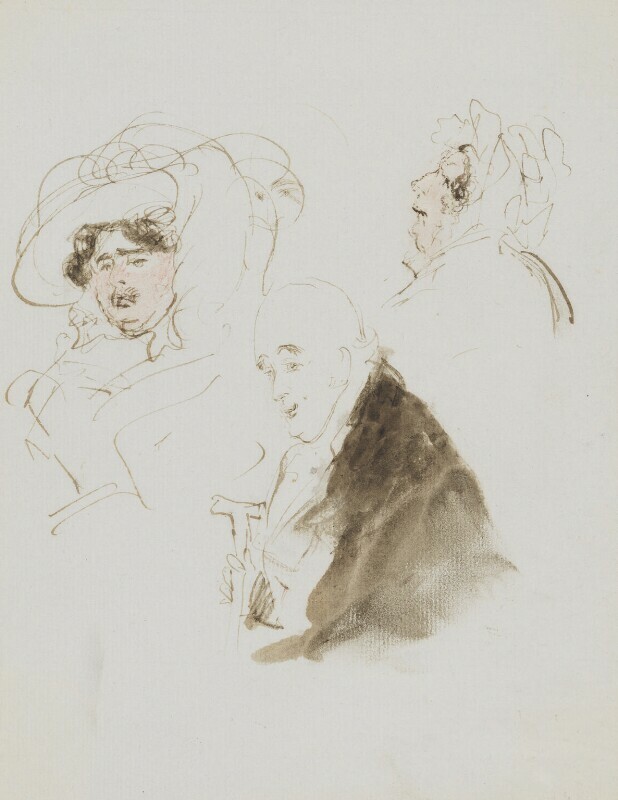 Three undated Landseer drawings are at Baron's Court (boxes II and IV), 'Lord Holland seated with walking stick', 'Lady Holland with maid massaging her leg' and 'Lady Holland in wheelchair with page', exhibited RA 1961 (137). The 9 satirical drawings [NPG 4914-22] came from an album of 93 drawings, mostly by Landseer, others by Wilkie and D'Orsay, consisting of caricatures, figure and animal studies. The majority are in pen and brown ink, some with brown wash, a few with additions in red chalk, watercolour or sealing wax. The collection was probably formed by Charles Bennet, 6th Earl of Tankerville who as Lord Ossulston was MP for North Northumberland 1832-59 and very much a man about town. Landseer's first meeting with Ossulston is described dramatically in Reminiscences of Life in the Highlands, Landseer being caught red-handed poaching a stag in Glen Feshie forest. They became firm friends and the 'Hunting of Chevy Chase' (Birmingham Art Gallery) was conceived on a visit to Chillingham in 1825. The first drawing in the album was Landseer and a servant leaving Chillingham Castle 27 September 1835; the earliest dated drawing was 1832, the latest, an illustrated letter from Landseer to Ossulston, 10 October 1852. The album was probably put together at Chillingham Castle by Lady Ida Tankerville, Lord Ossulston's daughter (b. 1857) who married the 13th Earl of Dalhousie in 1877, and was in the family possession until its sale at Christie's in 1972. A group of Lord Holland, head and shoulders to left smiling benevolently in black coat holding walking stick, Lady Holland on the left in a large feather hat and commanding expression, her face lightly chalked in red; Mrs Brown to the right, her nose in the air and face also lightly chalked in red. Chillingham Castle (Earl of Tankerville), Lady Ida Tankerville and to her grandson David Patrick Ramsay, Christie's 11 July 1972 (23) bought Agnew and sold to the NPG.